In this modern and well-maintained, detached house in Aups (600 m), you can completely relax. 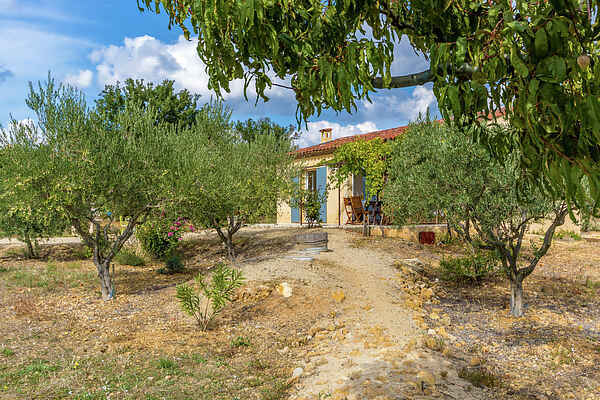 From your lounge chairs on the large terrace you look at the beautiful olive groves and you are surrounded by the scents and colors of the Provence. When the first beads of sweat appear, you walk over to the shared, gated pool, situated on the owner's lower level grounds (no visual contact between the houses). Then it's time for a stroll to the market and the bakery in the lovely medieval village of Aups, the capital of black gold (truffles). In the afternoon you can go sailing and pedal boating in the Lac de Ste. Croix in Bauduen (16km) or canoeing and rafting by the famous Gorges du Verdon river canyon (40 km). The next day, perhaps a cultural day trip? For instance, to the 12th century Abbey of Thoronet (30 km), the medieval village of Moustiers-Ste. Marie (35 km) or the beautiful castles of Les Arcs (35 km) and Entrecastaux (17 km), and of course you have to stock up on wine at the famous wineries in the area. For a fun day at the beach you go to Fréjus (60 km).